(Newport Beach, California) - Professional Coin Grading Service has certified the first reported Sacagawea golden dollar coin struck with the edge lettering intended only for Presidential dollars. The submitter will receive a $10,000 finder’s reward from PCGS. “The United States Mint set up specific internal procedures in an attempt to prevent this type of error from happening. But it did happen, and it’s an amazing-looking error,” said Ron Guth, PCGS President. The 2007-dated coin was struck at the Denver Mint and has been examined and authenticated by the experts at PCGS. 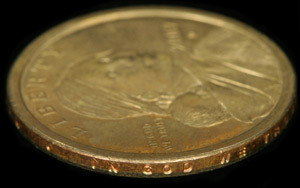 The coin was submitted by Andrew Moores of Lakewood, Colorado who found the coin in his pocket change. Moores believes he could have had the coin for as long as two weeks and only noticed it when he compared it with other Sacagawea Dollars that he had already set aside.